When you are part of a powerful organization such as the Galactic Empire, with the Sith helming it, you know that you are in safe hands. Basically, you are in the majority, and the pension isn’t too bad either, not to mention the perks that come with the job. However, being in a position of strength would mean most of the other planets that you patrol cower in fear, allowing you to have plenty of free time on your hands. What better way to kill those midnight watch sessions than with a game of poker? 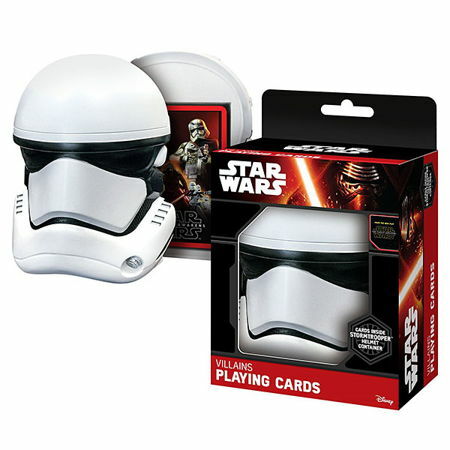 You might as well go all out with the $8.99 Star Wars The Force Awakens Playing Cards that arrive in a First Order Stormtrooper helmet. Needless to say, Kylo Ren is both the King and the Ace in each suit, and Captain Phasma is the Queen in each suit. Pretty cool for Star Wars fans, no?